Open Monday to Wednesday, 4 p.m.-9 p.m.
Thursday and Friday, open until 10 p.m.
Saturday, noon-10 p.m.; Sunday, noon-9 p.m. The state has initiated the first annual restaurant week and it’s time to hit the road. From May 18 to 25, more than 125 restaurants across the state are offering special prix-fixe menus for lunch and dinner. Most of the top chefs and destinations are included, and so are those up-and-comers you just heard about. Make it a foodie weekend and head north to North Conway or west to Keene – there are lodging specials in those locales. The Margarita Grill in Glen is not a newcomer – owner Corrine Rober’s parents opened the eatery in 1983 but the restaurant and staff have a new attitude. They got serious about environmental concerns and were recently named an “Environmental Champion” by the New Hampshire Sustainable Lodging and Restaurant Program for their waste reduction, water conservation, energy efficiency and use of local and organic food products. It was the latter that has brought them more accolades and a sense of pride for the menu. Recently Corrine applied for and was granted the use of the label “Certified Local” by the New Hampshire Farm to Restaurant Connection. This is no small matter. The application process is a bit tedious and strict. A variety of categories are considered for review including the use of local produce, dairy and meats, but additional points can be earned for the use of “value added” products, such as local jams and smokehouse meats. The application fee is nominal, but applicants have to be willing to open their kitchens to volunteer “inspectors” that need to verify the application. Points needed to pass certification can be earned in various categories so it is the total effort that is judged. For instance, maybe local meats are difficult to procure but local cheese is readily available. Finally, you get points for touting your relationship with local farmers by posting a chalkboard or otherwise making diners aware of your existing relationships. Corrine’s chefs, Bud Selmi and Lisa Raymond, have picked up the ball and have new playground rules for developing recipes. Recently Raymond created a palate-perfect sticky rib with the liqueur Root as a base flavor. Root, Snap and Rhub are products developed by Steven Grasse, a Tamworth summer resident with plans to distill the product locally. Corrine has contracted organic grower Pork Hill Farm in Ossipee to plant pepper, cilantro, tomatoes and more. Contract growing is a way to encourage farmers to diversify their crops, besides offering them peace of mind. Knowing that they have a market for a hillside of Italian arugula, they can plant with confidence. In Portsmouth, Black Trumpet owner Evan Mallet takes full advantage of contract growing on the Seacoast and encourages his farmers to plant heirloom varieties as well. Besides their commitment to sustainability, the Margarita Grill has a lot to offer. Corrine knows her tequilas, having been in the business since she was kneehigh to a cactus. Just as important, the margaritas are made with fresh-squeezed limes and grapefruit for a true tang. Not everything on the menu is covered with cheese. Healthy options include a roasted vegetable salad ($6), a pan-fried vegetarian quesadilla ($9.76 half, $16 whole) and their Baja fish taco with grilled tilapia, jalapeno tartar sauce and a side of red grape pico de gallo ($12 for one, $17 for two). The mandatory sides for a Southwestern-inspired restaurant, beans and rice, are not just plops of plain beans and rice to fill out the plate. Here, you will want to eat them. The Aztec rice is a mixture that includes wild rice and cumin and the Honey Rum Black Beans speak for themselves – a little later, ha ha. A smoker out back provides the mandatory BBQ. The pork ribs I tried were spectacular, with a perfect complement of sweet and tangy while falling off the bone. Nothing is just ordinary at this Glen eatery. The salsa has cranberries, the turkey is roasted or smoked on site. Feel you need to spice it up? 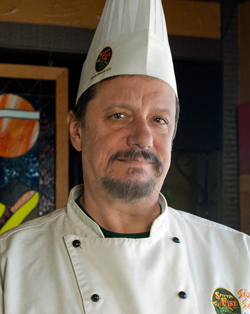 Pour on Chef Bud Selmi’s award-winning Sizzlin’ Sauces. Oh, yeah, the desserts are homemade too and there’s local art on the walls. Corrine’s sister’s work is especially nice. Her super-close paintings of flowers and vegetables are well executed and available as giclée prints. There is much to love here and with the added incentives of prix-fixe menus and better weather, it’s time to put the rubber to the road. More photos from the Margarita Grill in Glen, NH.